The best treks to take in Ladakh include options for all fitness levels and experience, and there are many trekking companies in Leh that offer them if you don't want to go it alone. These companies provide tents, ponies, guides, and meals. Alternatively, it's often possible to stay in simple village homestay accommodations, with meals given. You'll most likely find a large variation in price between trekking companies. This reflects the quality of equipment, food, and services, and can really make a difference to the experience you'll have. Recommended trekking companies include Yama Adventures, Dreamland Trek and Tours, Overland Escape, Rimo Expeditions, and Ladakhi Women's Travel Company (the first female owned and operated trekking company in Ladakh). Homestay accommodations can be booked through Himalayan Homestays in Ladakh's Sham, Hemis and Zanskar regions. The homestays provide villagers with a welcome additional source of income, which helps conserve wildlife including the rare snow leopard. Do note that facilities are very basic in these traditional farming homes, and showers and proper bathrooms are rare. These top homestays in Leh are also recommended. Companies offering the Markha Valley trek are ubiquitous in Leh's Main Bazaar. Don't be fooled into thinking this trek is for everyone though. It's not an easy trek! It entails crossing two or three high altitude mountain passes (16,000-17,000 feet above sea level), as well as spending several nights at very high altitudes. Undoubtedly, the appeal of this trek is that it provides an outstanding combination of Ladakhi culture and lifestyle, and stark landscapes with canyons and rock formations. The Markha Valley is situated between the Zanskar and Stok and ranges, south of Leh. The starting point of the trek, at Spituk, is conveniently located less than 30 minutes from Leh. The trek passes through Hemis National Park, and the road only goes up until Zingchen at the park entry point. This is one of the largest protected national parks in India and the only one north of the Himalayas. An entrance fee is payable. If you wish, it's possible to avoid carrying a tent and camping out. Village homestay accommodations, and accommodations in local tea houses/parachute cafes (made out of parachutes used by the military to drop supplies to troops), are widely available. Duration: 6-8 days. The full trek is 10 days. Hours of Trekking Per Day: 4-6 hours on Day 1, 5-6 hours on Day 2, 7-8 hours on Day 3, 6-7 hours on Day 4, 7-8 hours on Day 5, 1.5-3 hours on Day 6, 7-8 hours on Day 7, 3-4 hours on Day 8. Route: Spituk-Zingchen-Kandala Base Camp-Skiu-Markha-Thujungtse-Tsigu-Nyimaling-Shang Sumdo-Hemis. You can save a day by starting from Zingchen, rather than trekking along the road from Spituk. This trek also has a number of route variations. Add a climb of Stock Kangri if you're super fit. Highlights: Panoramic vistas from high altitude passes. Fort ruins at Markha and Hankar. A visit to Hemis monastery at the end of the trek. When to Go: Mid June to late September. New to trekking? This is the easiest trek in Ladakh and a great starting point. It will take you through villages in Ladakh's arid Sham region, situated just north of the Indus River to the west of Leh. The starting point, at Likir, is 1.5 hours from Leh. The trek is ideal for beginners for a number of reasons: it's at a lower altitude compared to many other treks (all high passes are less than 13,000 feet above sea level), the distance between passes is relatively short, and homestay accommodations are plentiful. This makes it possible to do the trek without porters and guides. However, even though this trek is often referred to as a "baby trek", it doesn't mean it's without challenges. Do expect quite a bit of uphill walking. That said, it's suitable for anyone of average fitness. The only drawback is that the road is often visible on the trek. Hours of Trekking Per Day: 4-5 hours on Day 1, 2-3 hours on Day 2, 3 hours on Day 3 and 4. Highlights: Rugged and frequently changing landscape, plus monasteries at Likir and Ridzong. When to Go: Anytime from late May to late September (although you may want to avoid the warmer middle months). Four of the earliest surviving monasteries in Ladakh lie along the route of this advanced trek, which is harder than the popular Markha Valley one. The trek provides a fantastic opportunity to connect with the heritage of the region. It commences at Lamayuru, about 3 hours drive along the Srinagar-Leh Highway, through the Sham Valley. 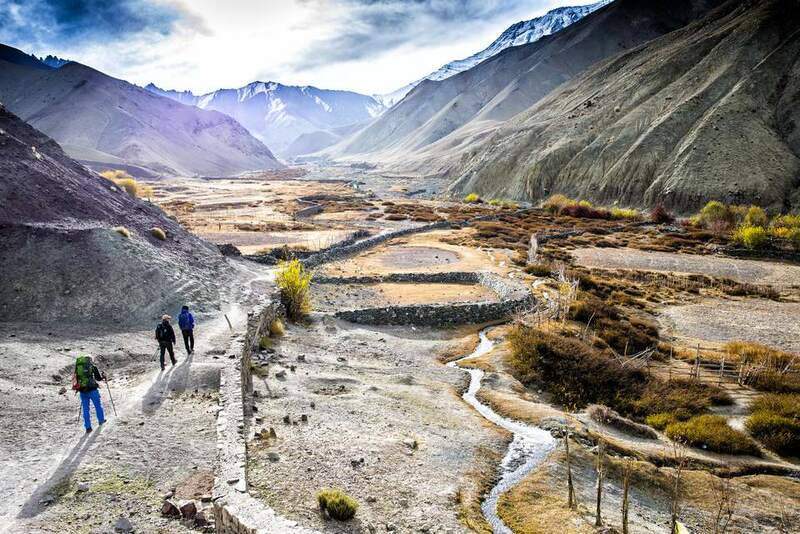 This memorable village is the starting point for many treks in Ladakh. Although the village has guesthouses, Lamayuru Monastery is spectacularly perched just above the camping ground. The trek is undeniably tough in parts but the sparkling clear streams and view of the Zanskar Range make it worth it! Hours of Trekking Per Day: 4-5 hours on Day 1, 5-6 hours on Day 2, 4-5 hours on Day 3, 5-6 hours on Day 4, and 7 hours on Day 5. Highlights: Lamayuru Monastery, the oldest monastery in Ladakh, dates back to the 11the century and is where the mystic Naropa mediated in a cave. Alchi Monastery, celebrated for its impressive early Kashmiri Buddhist murals. The classic trek from Spituk to Stok is a shorter and more accessible variation of the Markha Valley Trek. It starts off along the same route, from Spituk, but diverges across Stock Pass. This is the only pass on the trek and it's around 16,000 feet above sea level. Nature lovers can spend a couple of days staying in magical Rumbak village and exploring surrounding Hemis National Park with trained local guides. The area is especially pretty in late July when the barley fields are in bloom. If you don't feel capable of doing the whole trek, Zingchen to Rumbak is a moderate half-day day trek, and you can return from there without encountering the most difficult part of the route. Hours of Trekking Per Day: 4-6 hours on Day 1, 4-5 hours on Day 2, 4-5 hours on Day 3, 4 hours on Day 4. Highlights: Views of the Indus Valley from Stok Pass. Flora and fauna in Hemis National Park. Visiting Stok Palace at the end of the trek. Snowfall starts covering the higher regions of Ladakh at the end of September, cutting the Zanskar Valley off to the rest of the world for nine months. With the only road becoming inaccessible, resourceful residents walk along the frozen Zanskar River during the height of winter to get into or out of the region. The sheet of ice that forms on the river is referred to as the chadar. If you're fit, up for an adventure and don't mind the extreme cold, you can also walk (or rather shuffle and slide across the slippery ice) this way. A series of caves will be your accommodations each night, providing protection from the bitter wind. Level: It's one of the hardest treks in India. Hours of Trekking Per Day: The full length of the trek is just over 100 kilometers (62 miles). Trekkers must cover an average of 15 kilometers (9.3 miles) in about 5 hours per day. Route: Treks follow the river from Chilling village, around 2 hours southwest of Leh. Highlights: Pristine white beauty of the trail, walking on ice and climbing over icy rocks. When to Go: Mid-January to mid-February. Although this is a lengthy trek that goes all the way from Zanskar in Ladakh into Lahaul in Himachal Pradesh, it's not very arduous and is a good option for anyone undertaking a trans-Himalaya trek for the first time. There's only one high altitude pass, at about 16,500 feet above sea level, and plenty of village homestays and campsites. The trek starts in Padum, about 2 days drive from Leh with an overnight stay in Kargil. It heads towards the Lugnak Valley, southeast of Zanskar, which was historically used for trade between Zanskar and Lahaul. For an additional challenge, it's possible to connect this trek with one from Lamayuru to Padum. This will make it an unforgettable 20-day experience. It's best to do the trek sooner rather than later, as a road is being built between Padum and Darcha. Hours of Trekking Per Day: 1.5 hours on Day 1, 5 hours on Day 2, 6-7 hours on Day 3, 4 hours on Day 4, 4-5 hours on Day 5, 6-7 hours on Day 6, 6 hours on Day 7, 7 hours on Day 8, and 7 hours on Day 9. Route: Padum-Shilla-Reru-Changpa Tsetan-Purne-Phuktal-Purne-Kargyak-Shingo La Base-Ramjak-Pal Lhamo-Darcha. Highlights: Phuktal monastery, one of the most mindblowing monasteries in India for its isolated location, reachable only by trekking. Gombu Rangjom, a magnificent monolithic rock, poetically surrounded by wildflowers and grazing yaks. When to Go: June to September.